The 2018 version works on Windows 10, MAC, iPad, Android & all mobile phones. 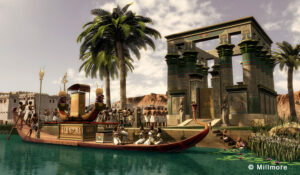 From the earliest reed temples to the vast New Kingdom temple complexes. The Egyptian temple is explained with cut away diagrams and meticulously detailed 3D reconstructions. 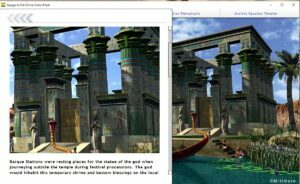 Hover your mouse and click the reconstruction to find out about Karnak’s Great Court and the ceremonies that took place within its precincts. Interactive text illustrated with reconstructions, photos and video. Papyri translations, which have been edited to make them easy for the modern reader. 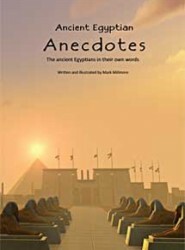 It’s the Ancient Egyptians in their own words supported with background text and beautifully illustrated. Board games were a favourite pastime in ancient Egypt, and Senet was the most popular. Learning Egyptian Hieroglyphs made easy. More than 800 glyph illustrations including 400 Egyptian word examples and over 300 hieroglyphs from the Gardiner list. Ancient Egyptian Papyri translations edited to make them easy for the modern reader and beautifully illustrated. The Greek historian Herodotus was told this story by Egyptian priests in the 5th century BC. But it is a good deal older and was much-loved by ancient Egyptians.